Sidney Health Center medical providers are reporting an increasing number of patients who are complaining of fever, headache and general body aches. The flu is a virus which is very contagious and spread mainly by droplets in the air when infected people cough, sneeze or talk. These droplets carry the flu virus from the infected person into the mouths and/or noses of non-infected people who breathe in these droplets. A person can also get the flu from touching a surface or object that has the flu virus on it and then touching their face, mouth or nose. 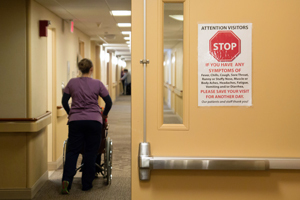 To prevent the spread of disease among patients, residents and staff, Sidney Health Center is restricting visitation in designated areas at the hospital, Extended Care and The Lodge. Sidney Health Center’s mission is to help those we serve achieve their highest level of health and well-being. Administration thanks the community including our patients, residents, guests and staff for following the recommended guidelines to help reduce the spread of flu in the MonDak region. The most common symptoms of the flu include fever, severe headache, general body aches and chills. Other associated symptoms are cough, sore throat, fatigue, stuffy or runny nose and decreased appetite. Many people correlate nausea, vomiting and diarrhea as the flu; however, these symptoms are actually indication of gastroenteritis. The most important action to prevent the flu is to get a flu vaccination. Equally important is to stop the spread of the flu. Individuals who are sick with flu-like symptoms should stay home until 24 hours after their fever is gone unless they are seeking medical care. Additional precautions to avoid the spread of the flu include washing hands with soap and water or hand sanitizer as well as cleaning and disinfecting surfaces and objects that could be contaminated with the flu. Most people are able to recover from the flu without medical care. However, the CDC has indicated some antiviral drugs can lessen the symptoms of the flu if started within the first 2-3 days from the onset of illness.